“Can I take communion today?” A tray of bread is already coming down the row. You have only a few seconds to respond. What do you say? Who should take communion? As parents, we must give spiritual guidance to our children by being ready to respond to their questions about communion and their desire to participate in this worship activity of the church. A simple answer to the question of who should participate is “all Christ-followers”, that is, people who “confess Jesus Christ as Lord.” Children who believe and confess that Jesus is Lord have an authentic faith. However, they may have a limited understanding of the meaning and depth of communion. Though children can participate, we highly encourage parents to insure their child understands its meaning and significance. As Christ-followers, to participate in the Lord’s Supper is to declare that God’s gift of grace and forgiveness has been accepted and a personal relationship with Christ has been established. What is taking communion in “a manner that is worthy”? While understanding that the meaning of communion involves a look backwards and forwards, it also involves a good look at the present. Paul writes further in 1 Corinthians 11:27-29, “Therefore, whoever eats the bread or drinks the cup of the Lord in an unworthy manner will be guilty of sinning against the body and blood of the Lord. A man ought to examine himself before he eats of the bread and drinks of the cup. For anyone who eats and drinks without recognizing the body of the Lord eats and drinks judgment on himself.” As Christ-followers, we are called to reflect upon the condition of our relationship with Christ and even our relationships with others (see Matthew 5:23-24). This involves self-examination, confession of sin and the recognition of forgiveness received. Do I have to be baptized to take communion? No, baptism is not required to participate in communion. As a church, we recognize the importance of believer’s baptism as a testimony to others of the individual’s desire to be a Christ-follower and the change in their life. In the New Testament a confession of faith was typically followed by immediate baptism (Acts 8:12;16:29-33). We encourage every Christ-follower to follow Jesus Christ’s example (Matthew 3:13-17) in obedience by being baptized as an outward sign of the inward change in their life. There are times in life when the best learning experience is participation. Communion is a celebration that may be enriched by opportunities to learn before participation. The following are some basic steps to assist you in preparing a child for communion. They move through three stages: observation, involvement and participation. The following diagram illustrates this progression. The most basic form of participation is watching others take part in communion. The observation stage engages children by raising questions (Exodus 12:26-27). Often the questions are asked during a service, a time when adequate answers cannot be given. Set aside another time to sit down with your children and answer their questions. It is particularly helpful to share what communion means to you. As observation increases understanding, the desire to participate may also increase. Make it a point to involve your children as they continue to learn. Before a communion service, lead them through a time of personal reflection just as you would engage in self-examination to prepare your own self. Help them understand both the seriousness and the celebration of thankfulness that accompanies forgiveness. Encourage them to ask questions of grandparents, pastor, teachers and others. Read the story of Jesus’ Last Supper (Luke 22:7-20) and communion scriptures in the New Testament with them (1 Corinthians 11:11-22). During communion, allow them to handle communion trays as they are passed. Remember to encourage your child during this growing process. If children do not yet have the clear ability to express in adult language what communion means, that does not mean they lack understanding. A child who has been involved in the previous stages will have shown whether they are ready to participate. The question, “Can I take communion today?” will not come as a surprise. You will be able to respond with confidence that your child has understood the significance and meaning of communion. 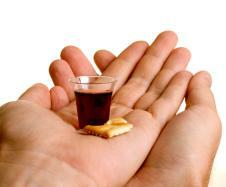 At Northpointe, the invitation to participate in communion is open to all Christ-followers, young and old. As the primary spiritual influence in your child’s life, you are the accountability link between your child and the larger church family. You are best suited to determine if your child has made a genuine decision to follow Jesus Christ in their life. During worship, sit together and be the one to serve your child. Be sensitive and recognize that peer pressure may be a factor in wanting to participate, both for your child and other children. Remember that participation one time does not assume participation next time. Remember, your child’s personal preparation rather than precedent is what the decision to participate rests upon. Just because they have taken communion before does not dictate whether they should take it this time.